Turnips (Brassica rapa) are cool-season root vegetables that belong to the Brassicaceae family, along with cabbages and Brussels sprouts. Cultivated for both human consumption and livestock feed, turnips are prized for the strong flavors of their roots and for their nutritional value. Turnips were staple foods during the ancient Greek and Roman periods, and are extensively used in the cuisines of Japan, Brazil, England, and Iran. Fresh turnip roots are rich in vitamin C: A 100 g serving can provide 21 mg or 35 percent of the recommended daily allowance of this important mineral. From scavenging free radicals to boosting collagen synthesis to strengthening the immune system, vitamin C does a lot for the body. Turnips have two important nutrients for healthy hearts: fiber and potassium. While fiber removes excess cholesterol from the heart, potassium relaxes the blood vessels and arteries to lower blood pressure. Vitamin K has anti-inflammatory properties that extend to the heart. Turnips are excellent foods for maintaining vision because of their vitamin C, vitamin A, and lutein content. Vitamin C and lutein protect the eyes from UV light damage, and vitamin A eliminates free radicals that could lead to macular degeneration and cataracts. The turnip greens and roots contain tiny amounts of oxalic acid, which may crystallize into oxalate stones in the urinary tract and kidneys. People with a history of oxalate urinary tract stones should avoid turnips. Those with thyroid disorders should refrain from consuming turnips as well as certain compounds in turnips can affect the thyroid gland. The fiber in turnips is conducive to a healthy digestive system. By bulking up stool and facilitating better nutrition uptake from food, turnips can promote digestive efficiency. Another benefit from turnips is they decrease the chances of developing diverticulosis, or the presence of sacs along the wall of the gastrointestinal tract. Both the roots and greens have culinary uses. Baby turnips have a sweet taste that makes them a good complement for raw salads made of cabbage and parsnips. Raw baby turnips, on the other hand, go well with olives and cherry tomatoes as appetizers. Similar to radishes and carrots, both mature and baby turnips can be pickled. Turnip greens are usually added to soups, curries, and stews. Though they’re usually cooked, turnip greens can do well in salads. Turnips promote a healthy heart. Turnips help maintain healthy vision. 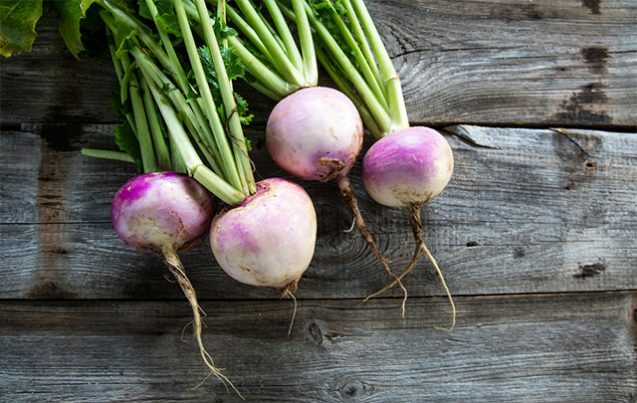 People with a history of oxalate urinary tract stones should avoid turnips.